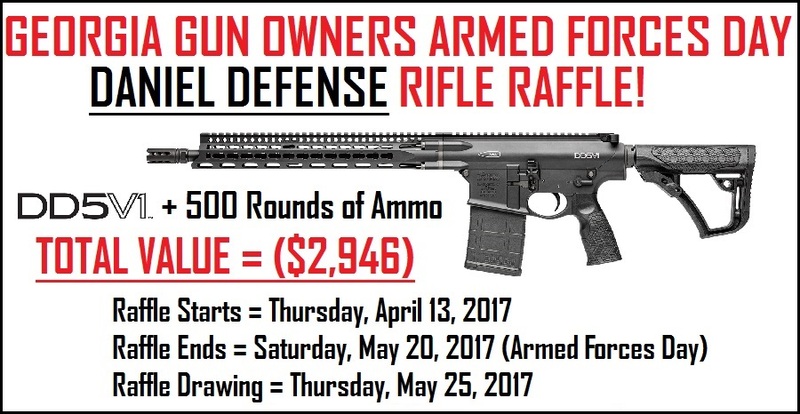 Armed Forces Day Rifle Raffle! The Georgia Gun Owners Armed Forces Day Rifle Raffle is starting right now! We’re raffling off a Daniel Defense DD5V1 Rifle like the one pictured below plus 500 rounds of ammunition (valued at $2,946)! Buy at least one raffle ticket and also receive a GGO “Liberty or Death” t-shirt in the mail along with a GGO bumper sticker! Raffle ends on Armed Forces Day, May 20. Raffle tickets will be mailed to your address upon purchase. So don’t delay — click here or below and purchase your GGO Armed Forces Day Rifle Raffle tickets today! Winner will be announced on email and Facebook on Thursday, May 25, 2017.